Their unexpected interrogation was being widely interpreted today by Shiite-led opposition and its sympathizers as a sign that, despite the king’s offer for dialogue, the Bahrain government plans to play hardball. There were some so-called “flash protests” in some of the Shia villages outside the capital, as shown in these YouTube-posted videos: Protests in Bilad Al Qadeem and Bani Jamrah. But they were dispersed by police gunshots (whether of rubber bullets or live fire, it’s not clear) within minutes. And Shiites from the villages couldn’t flock to Manama, even if they dared. Observers reported that entrances to the villages were blocked, no longer by armored military vehicles, but by large buses filled with anti-riot police. But the opposition seems paralyzed. 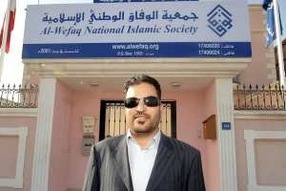 The Al Wefaq leadership has said it’s ready to talk in principle. But it hasn’t responded formally to the King’s offer, and says the ground rules, while still vague, appear rigged. Nor has it decided whether to participate in the September elections for the parliamentary seats that their members resigned from during the protests. And now there’s a new player coming at them from the right — a Sunni-led pro-government group, the National Unity Coalition, that is pressing to be included in any talks, and charges that Al Wefaq, or at least its current leadership, is a pawn of Bahrain’s Shiite-ruled nemesis Iran. The government’s message campaign is already underway. It is urging the governing body of the Formula One race, meeting Friday, to reinstate the lucrative event that was cancelled earlier this year. And Bahrain’s Foreign Minister was making the rounds this week in Washington this week, paving the way for the Bahraini Crown Prince to visit in the next two weeks, carrying a back-to-normal, on-the-reform path message directly to President Obama. But in the end, Bahrain’s future depends on how the King and his ruling family address not foreign audiences but their own subjects.